This park is strangely the only off-leash dog park in all of Kitsilano. With all the dog water bowls outside of the local shops you'd think that there would be more. This may be why many people trek it all the way down to the west end of Spanish Banks for a free for all with their pouch. But Hadden Park or "Dog Beach" to some is where you'll want to go to let Rover romp sans leash if you're staying in Kits. You should check Hadden park out and let us know what you think. 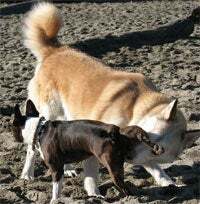 We're all for more places to hang with your park outside and there seems to be a strong voice headed towards the City of Vancouver to increase the no-leash space for Kits residents. For directions and more information on Hadden check out the Park Board's website. One of the other dog adventures that you can experience in Kits is the Arbutus corridor. This trail that follows the train tracks was once a working rail line and recently up for consideration as a home for the RAV line. Some speculate that the wealthy residents of Shaughnessy were able to keep the high speed transportation from the airport to downtown out of their backyard and as a result Cambie was tapped as the RAV home. Whether that's true or not it's a great place to take your dog. Just head over to Arbutus and head south. You'll see other dogs, bikers, and walkers. Wooof. For those of us with children, the choice of education is up there with the most important decision you can make for you child. We've dialed out a list of schools in Kitsilano for you to check out yourself.